Sales of bottled water have grown at a steady rate, and it's estimated that people spend between $50 and $100 billion worldwide each year for the stuff. But is it worth it? In a nutshell, bottled water is expensive, bad for the environment and no healthier for you than tap water. 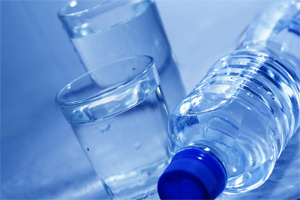 In terms of cost, bottled water can be up to 10,000 times more expensive than tap water. Municipal tap water costs $0.0015 per gallon, whereas bottled water can cost up to $10 a gallon. This works out to 7 cents an ounce. In comparison, gasoline (which most people find expensive) is less than 3 cents an ounce. Additionally, 40% of bottled water is drawn from the same municipal water sources your tap water comes from, but is simply filtered, something you can easily do yourself at home. Bottled water is bad for the environment in a few ways. First of all, the production of water bottles is very resource intensive, using 17 million barrels of oil, enough to power 1 million cars for a year. Second, only 1 in 5 water bottles are recycled, amounting to 3 billion pounds of wasted plastic that ends up in landfills, and as they are not biodegradable, they will linger for generations, taking thousands of years to decompose, slowly leaching pthalates and other chemicals into the groundwater. One of the main reasons people buy bottled water is due to the belief that it is healthier than tap water; however, this is a myth. Municipal tap water must adhere to strict monitoring standards as to water quality, something bottled water companies need not do. For instance, bottled water does not need to be checked for E. coli contamination, does not need to provide the water source, is not required to produce regular quality reports and can still be distributed when tap water level standards are not met. Municipal water must be tested for coliform bacteria upwards of 100 times per month, while bottled water is tested once a week. In fact, 22% of bottled water tested proved to have chemical contaminants at levels above state health limits. The only real benefit of bottled water over tap is if you are traveling in an area where the water is not reliable or there is no access to clean water, or to have some on hand in case of a natural disaster. Apart from that, it is better to make up your own water bottles at home. If the taste of the water in your municipality is not great, an inexpensive carbon filter can easily be used to make it taste just as good as the bottled version.